HANOVER, Germany — The redesigned Sprinter van from Daimler Trucks and Buses gives commercial customers a suite of technologies that offers a way for fleet managers, vehicles and drivers to stay connected via a system tailored to their needs, the company said during the IAA Commercial Vehicles show. In a Sept. 19 presentation on the event’s first day of press conferences, Mercedes-Benz Vans head of marketing Klaus Meier compared the difference in the new Sprinter’s updated suite of technologies versus older models to the capabilities of modern smartphones compared with the earliest examples. Via a permanent internet connection, the van links to customers through the company’s Mercedes Pro communications suite, which offers eight packages and a total of 18 different services, Meier said, including fleet management, navigation and driving-style analysis. “Our customers can control orders online and send new routes to the vehicle, or check vehicle information such as location, fuel level or maintenance information,” he said. 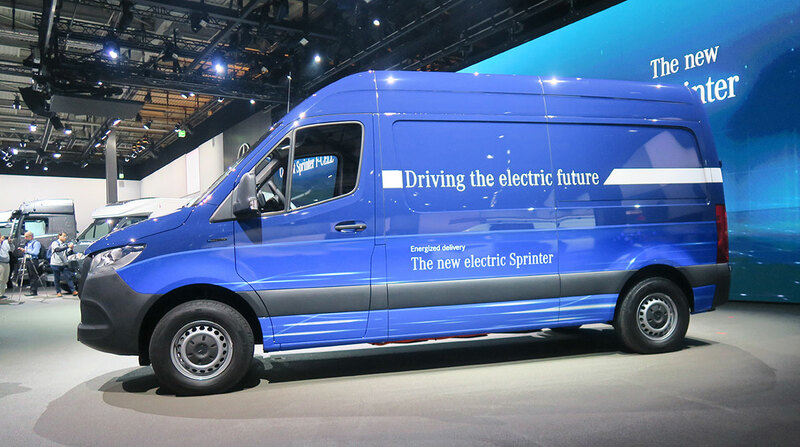 It also will offer a new power option when the electric-powered eSprinter enters production next year. Designed for inner-city routes, the van can be spec’d for either higher payload or longer range, and 80% of its total range will be available after 30 minutes of charging time, said Benjamin Kahler, head of eDrive for Mercedes-Benz Vans. The company also showcased the Sprinter F-Cell concept, which combines fuel cell and battery technology in a plug-in hybrid vehicle. Configured to hold three hydrogen tanks, a fourth could be added to extend range, Kahler said. While the concept was outfitted as a camper, he said the setup also could work for other applications, including passenger transport.